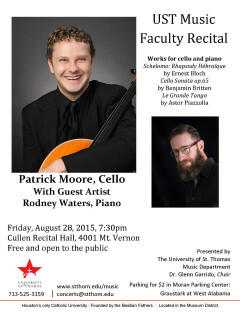 Patrick Moore is the principal cellist of the Houston Latin Philharmonic Orchestra, The Cypress Symphony and is the assistant principal cellist with Opera in the Heights, and the Symphony of Southeast Texas. He is also a founding member of the Axiom Quartet and is an adjunct faculty member of the University of St. Thomas and the American Festival for the Arts. In this program he collaborates with pianist Rodney Waters.